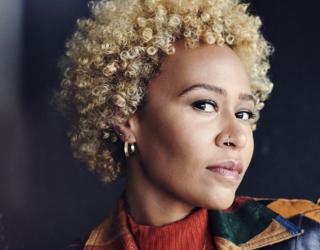 Listen to Emeli Sande's new single Sparrow and you'll hear dozens of influences: the spirituality of Aretha Franklin, the sophisticated phrasing of Anita Baker, the lyrical positivity of Alicia Keys. But there's another, unexpected, inspiration: Disney's The Little Mermaid. "When I was three or four, I would just play that movie and rewind it and play it and rewind it and play it," the singer laughs. Last summer, Sande dusted down her old Disney videos, using them as a sort of instruction manual for her third album. "When you see the way children gravitate towards Frozen or The Little Mermaid or even The Greatest Showman, it's clear there's a real longing for melody," she explains. "I have to check myself sometimes because hip-hop has become the new pop, and melodies can get very 'one note'. "Don't get me wrong, it's fun to write like that sometimes - but I had to go back and listen to Disney films and musicals and even classical music to remind myself of all the other things you can do. "I really believe the more melody we have, the better." We're speaking in the book-lined living room of Sande's flat, the day after her 32nd birthday. She's spent the morning curled up on the sofa, binge-watching Netflix comedy Bojack Horseman as she recovers from a party that culminated with a midnight jam session. That's essentially how she recorded the new album, too, working up ideas with a bunch of musicians in her newly-built recording studio. "Basically last summer was like a big writing camp," she says. "We'd start every day around two and talk rubbish for a few hours. Then people would cook - my speciality was vegan 'fake chicken nuggets' - and it all started to come together in the evening. "The freedom and the camaraderie made it so special. It kind of had this wildness. And in the end we got 200 songs or something crazy like that." To keep the music focused, she laid down two hard rules. She would write all the lyrics herself, and she would ban any digital instruments. The idea was to replicate the warmth and humanity of her favourite albums. "When I listen to Amy Winehouse, there's so much emotion in the mistakes," she says. "I think we've missed some of that because we have so many tools now to perfect everything. But then you listen to Bob Marley and Janis Joplin's live performances and it feels like it's breathing." The organic approach is even reflected in her image - the trademark whipped-cream quiff is gone as Sande opts for a more natural look. "With the quiff... when I first moved to London I just wanted to be badass and shave my hair and dye it for the first time. "It was wonderful for a year or two but after a while there was a lot of damage to my hair. So seven months ago I decided, 'I'm not going to touch it any more'. I let it grow out. It just feels really lovely. "So yeah, this whole thing, everything's very natural from the music to imagery." Sande's fresh approach follows a bumpy entry to the music business. The Scottish singer was thrust into the spotlight in 2012 when her debut album, Our Version of Events, spent 10 weeks at number one and broke a chart record set by The Beatles. The speed of her success and the burdens of promotion took a toll and, after winning two Brit Awards in 2013, she took a self-imposed career break, split from her manager of 12 years and went through a painful divorce. When she returned to music, it was with an album inspired by a "life-changing" trip to her father's homeland, Zambia, which reinforced the importance of family, community and spirituality. The songs tracked her journey from trauma (Hurts) to solitude (Lonely) and recovery (Highs and Lows) and the album was sizeable hit, earning Sande another Brit Award, with none of the attendant madness of her debut. "It was nice to discover a comfortable pace," she says. "I'm always grateful if there's work to be done - but sometimes I just need six months to go and be in touch with who I am artistically." Sparrow, which premiered on Zoe Ball's BBC Radio 2 breakfast show on Friday, is a rousing gospel anthem that reflects the star's renewed confidence. "I've been on a journey of real self-discovery and I just got to a point where I felt this kind of innate hope. "My hope is that, whatever mood you're in, the song can flip it and give you strength." Indicating a photograph that hangs above her television, Sande says her lyrics were inspired by the intoxicating positivity of Afrobeat king Fela Kuti. "He just reminded me of the power that music has and that people have," she says. "When I look back to the 60s and 70s there was a belief that we could change the world and that love was an option. "Now there's such a lack of confidence in what we can achieve - but I just want to celebrate humanity for the goodness we can have." Sande's faith in mankind was shaken when she visited the Nazi concentration camp Auschwitz during a tour stop in Poland last year. "It's a harrowing reminder of what we are capable of," she says. "The darker side of humanity is a real thing." The experience fed into another song on the album, Free As A Bird, after Sande's tour guide told her the story of Kazimierz Piechowski - a Polish prisoner who, along with three other captives, escaped in June 1942. "They managed to get hold of the soldiers' uniforms, steal a car and drive out of the camp," she recalls. "Imagine that sense of freedom, that sense of release... almost to a point where you'd feel sick. "I can never imagine that feeling, but that idea of escape from horror really inspired the second verse of the song. "So that was the first demo where I was like, 'This has to go on the album.'" As we speak on Monday, the album is days away from being finished ("we have to hand it in next week") but despite the looming deadline, Sande is excited and energised by the prospect of releasing new music. "I just want to speak to people and uplift them in some way," she smiles. "Music helped me through so much in my life, and I just want to give back what I took."